Peter Coleman must be a breath of fresh air for Lee Westwood, who'd gone winless for two years. They teamed together for a top ten together after Coleman left Langer, then won in Germany three weeks ago at the BMW in Munich, now they win again in Scotland at the Dunhill Links Championship. (Parting caddy Dave Renick left Westwood to go back with V.J. Singh and they won two weeks ago at Quad Cities on the U.S. PGA Tour.) Following is our story about the Langer/Coleman split. Caddy Peter Coleman and golf professional Bernard Langer part ways after 22 years! During their 'reign', Langer won the Masters twice, and over 50 tournaments world wide as well as a member of ten Ryder Cup teams. In parting Langer said. "We had a wonderful time together -and for many years it has worked for both of us but it can only work if it works for the both of you. Peter Coleman will elect to remain in Europe and the British Isles primarily to caddy exclusively for Lee Westwood. Langer has a home in Florida and spends most of his time there now. Said Coleman, "Basically, he wants to be mostly in America and I don't want to be stationed there. I don't want to have to work a couple of weeks in the States and then hang around on my own in some motel waiting for him to come out and play for another couple of weeks. We'll be parting as friends -there's no animosity -and in fact we're both a bit sad about the situation. But his circumstances have changed and I've got my life to lead. We've had some really good times together but I wanted something more stable. I don't want at my age to be jumping on transatlantic planes all the time." Peter is well known in Europe and is the guy golf fans in the U.S. saw back in the 1980's with the curly 'fro'. He has a home in the U.K. and wife and daughter. And, his daughter has an expensive hobby these days -show horses. Said Peter, "She goes for show jumping and dressage and she's brilliant!. It's costing me 1,000 pounds a month so I can't afford to stop working!" The current longest running caddy player relationship in professional golf is in America where Johnny Buckner has been the steady caddy for Joey Sindelar for the past 18 years. Also, Greg 'Piddler' Martin has worked steadily and exclusively for Dan Forsman for nearly 18 years consecutively. Other long standing runs -Fluff Cowan and Peter Jacobsen for 17 years prior to Fluff's going to work for Tiger in 1996; Mike Carrick and Tom Kite for nearly 20 years ending in 2000 -(Carrick now caddies for Jonathan Byrd). Phil 'Wobley' Morbey caddied steadily and consecutively for Ian Woosnam for 14 year's. 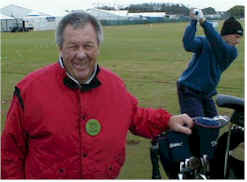 Herman Mitchell steadily caddied for Lee Trevino throughout the 1980's and into the mid 1990's a run of nearly 15 plus years. There have been other's who've caddied over long periods with a player but not consecutively and exclusively. Click Here to read Peter Coleman's 'Haul of Fame' interview!